Oh my hat bags, if you haven’t been to Ons Huisie in Bloubergstrand do yourself a favour and get down there. We went a while ago for a friends birthday and not only did we spend hours there enjoying each other’s company but I also had one of the BEST breakfasts I’ve eaten from a restaurant. I find I am often disappointed by the breakfast served when out, there are a few firm favourite spots and Ons Huisie now is on that list (although it is a bit of a drive from the burbs … so you’ll arrive hungry). 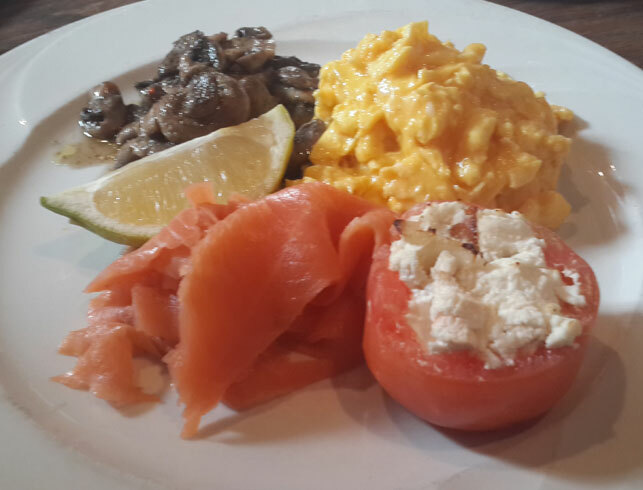 My breakfast fav’s include smoked salmon and my gripe is that you’ll often only receive a sliver or two on the plate. But not at Ons Huisie – to describe this as a generous portion doesn’t do it justice – just check out the pic! I ordered the Tomato Delight and the delight was how lip-smackingly moreish it was. 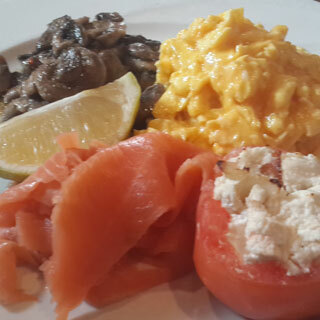 Fluffy scrambled eggs, plenty of salmon, scrumptious mushrooms (with plenty of black pepper and garlic) and a whole tomato with the inside scooped out and filled with feta and onion. Yummy delish deluxe! And to top it off we were served baskets of warm toast with a pile of butter and strawberry jam (my ultimate)! Oh and the price was a winner too! It’s really popular so if you plan on going best you pick up the phone first on +27 (0)21 554-1553. I will also add that everything we saw that came out of the kitchen looked divine and I’d love to go back to try out their lunch menu. Have you been to Ons Huisie? What did you enjoy? This entry was posted in Eat and tagged birthday, breakfast, friends, fun with friends, yummy delish.